Get outside and have some family fun during Spooktacular Saturday! It’s a day full of fall activities that everyone is sure to enjoy. 2 – 6pm: Wagon rides, caramel apples, petting zoo, pumpkin carving and more! 7:30 – 9:30pm: Choose between the family friendly Spooky Walk or terrifying Haunted Trail. Ride the Loki lift & follow the lanterns down your chosen trail. $7 per person, 6 & under free with paying adult. 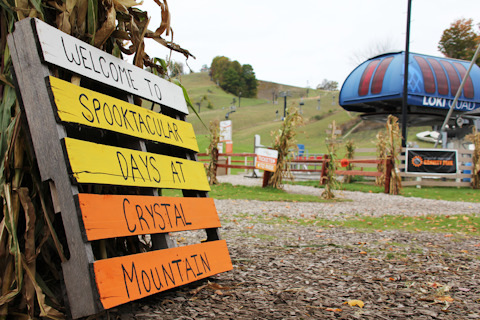 Includes the Spooky Walk or Haunted Trail, plus unlimited Alpine Slide (weather permitting), two climbs on the Climbing Wall, two laps on the Edge Adventure Course, and one daily Mountain Activity (Puffy Pillow, Glitter Tattoo, Tube-A-Licious Candy, Pumpkin Carving). The Fall Fun Pass is available October 13, 20 and 27, 2018 only. Cost: $39 per person or $20 for 52″ or under. Add Paintball*, Laser Tag*, Archery* or Bike Rental* for just $1 more!